Victor Yagualca is a passionate evangelist who is working in an inhospitable place in the North East of Argentina. 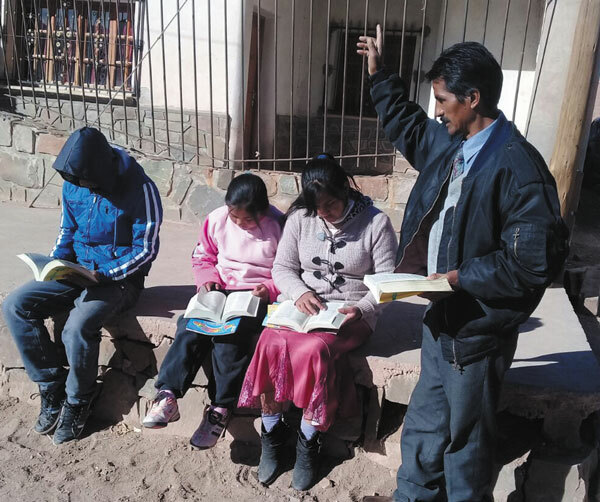 During 2018 he dedicated himself to evangelize in the province of Jujuy which borders Chile and Bolivia in the very North of Argentina. The inhabitants of this vast region exceed 180,000 inhabitants who live in extreme poverty and without contact with the outside world. Victor decided to dedicate all this year to reach these people with the Gospel of the Lord Jesus Christ. He travelled with his wife and youngest son bringing the Every Home for Christ campaign with literature to each home which is a blessing to many. By the middle of this year, Victor has managed to form two churches in this area and continues his task. Through the literature, devotionals, Gospels of John leaflets and Bibles which were distributed. 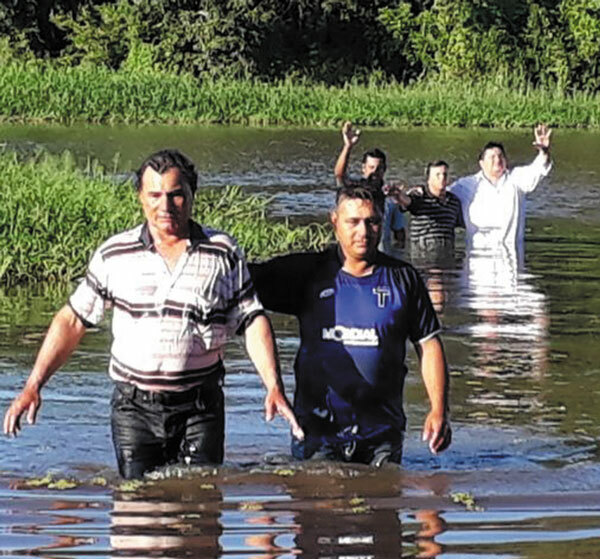 He told us that in Lagunillas they did not have water for a baptismal service, so the brothers had to make a sheet of ice, break a hole and celebrate the baptism at 20 degrees before zero. Evangelism in the city of Clorinda Formosa. The Pentecostal Holiness church of the city of Clorinda is run by Pastor Ruben Nunez who organized a massive evangelistic campaign in the city. They trained the believers in evangelism through a course called “Prayer and Evangelism”. Pastor Rino Belo, the leader of Every Home for Christ in Argentina, was asked by brother Ruben to come to the city to be interviewed by a local TV channel. When the interview took place the first question, the journalist asked was - “So, you are responsible for the invasion of these Gospel messages throughout our city?” Revival Movement printed ninety percent of the literature being distributed. Brother Rino paid attention to the word “invasion,” he answered, “Yes, an invasion of love” and then testified for 10 minutes on the message of God’s love. Pastor Ruben and the churches of Clorinda invaded every corner of the city and testified of Christ to the elderly, young children and many adults. Later he reported that 20 people had been baptized due to the evangelistic campaign. Wichi report. Francisco Mendez, the first convert by EHC ministry in 1991 has today become the leader of the indigenous work and is totally convinced through many experiences that a converted person immediately has a radical change in his life. Francisco tells the testimony of a man called Marcelino who was a sorcerer who tried several times to attack him for being a child of God. Seeing that he testified in the Name of Christ this man wanted to destroy him by doing works against him. As time went by Marcelino found that he could not do anything against the God of Francisco and he only realized and confessed to Francisco that the power of his God was greater than his own power. After Marcelino heard the message of salvation, he left his customs and accepted Christ into his heart and life as the only King and Lord. This testimony happened in the community near Formosa. “Leaving the impermeable Chaco in the Bermejo river with the canoe I was surprised when a great storm suddenly came. I was alone in the canoe and about to turn round. Then I made the decision to approach the shore where there was nothing, but it was better to be there than in the middle of the river in front of the danger that was coming. When I reached the shore in the middle of the storm, I saw a hut in the distance. I approached and found a community that had never been visited by anyone. This community has no name. It is close to the river, but nobody recognizes it. In this community, there are approximately 30 families where there are many children. These people have no documentation. They live on fishing. Everyone in the community spoke my language so I was able to preach the Gospel, and some accepted Christ at that moment. I will continue to visit them so that they can learn more of the Gospel and improve their lives in all senses. Let us pray that other communities like this will be reached and know Christ. In Wichis aboriginal communities there is a lot of witchcraft. This belief is very respected among them, and witches are men of great renown and exercise their power by manifesting it among the people. Witchcraft in the Wichis culture promises health, well-being, conversation and talking with the dead and the power of the witch doctor is not questionable. We must pray fervently because in communities where they do not know Christ there is always a sorcerer present and they must be reached with the Gospel.